1. Tarpaulin printer is also called PVC printer or eco solvent printer! Tarpaulin printing is one of the thriving businesses in the world today. With today's growing demand for printed materials for different occasions, opening a tarpaulin printing shop could be a profitable business. A good entrepreneurial ability combined with artistic skills is what you need in order to succeed in this endeavor. However, the most important thing is that you need a stable and reliable tarpaulin printer. Nowadays, I noticed that most individuals are now inclined to using these printed tarpaulins for different occasions. So, if you are contemplating on what specific business you would like to open, I would suggest a tarpaulin printing business. MT will not only provide tarpaulin printer to you but also provide tarpaulins and banners printing ideal solution for your advertising needs, both indoor and outdoor. The custom printed advertising tarpaulins are available. 2. PVC Printer is also called eco solvent printer! PVC, or polyvinyl chloride, is a plastic product used in manufacturing packaging, toys, shower curtains, and art and for graphic design. PVC is a flexible, lightweight and durable material that can be made into sheets suitable for inkjet PVC printer printing. Art and graphic designs can be printed on PVC sheets and then laminated for greater durability. PVC sheets are available in various finishes from glossy to dull. The matte finish PVC is widely used because it will accept most eco solvent inks and PVC printer printing. Purchase the style of PVC sheets pre-cut in sizes to fit the PVC printer. Matte finished PVC sheets will take ink better than smooth or glossy sheets. PVC sheets for printing have a rough side. This is the side that should print design on for PVC printer. The rough side will take the eco solvent ink and absorb it better than the smooth side. You can use the smooth side printing, but the eco solvent ink will take much longer to dry and may bubble depending on the humidity. Open graphic design or image editing program on computer. Open the graphic or photograph want to print on the PVC sheet. Make sure that the image want to print is of sufficient dpi (dots per inch) to produce a clear image. Click “Print” in RIP software. Make any adjustments like centering, borders, cropping or resizing before sending the image to the PVC printer. Allow the finished print to dry completely before attempt to frame the PVC sheet. Hold the PVC sheet by the edges to avoid touching the printed surface. Place the printed PVC sheet in a safe place away from heat and moisture and allow it to dry completely. PVC prints will usually dry in about 5 minutes. 1. Tarpaulin Printers equipped with Xaar1201or Epson DX5 printhead or Ricoh Gen5 printhead, Standard printing with double heads to meet the demand of high resolution and faster speed (Max. four printhead). 2. PVC Printers through different quality tests, which is stable and competent enough for mass production requirement. 3. Tarpaulin Printers equipped with intelligent infrared heater and fan drying system. 4. The LED UV printing system is optional; you may upgrade PVC Printers Printers to a LED Roll-To-Roll UV Printer once demanded. 5. Tarpaulin Printers adopt Aluminum-Alloy girder, which is the most strongest and smoothest than other metal materials, which ensure high precision printing quality. 6. 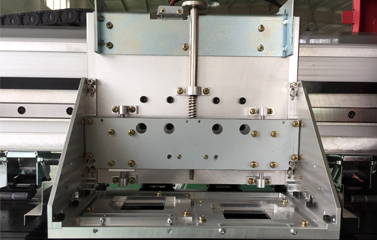 As a top quality PVC Printers adopt THK 20mm width linear guide rails with double-slider and sound off function, more durable and reliable for high precision printing. 7. Tarpaulin Printers own strong heavy-duty machine body (double stands and feet composite without any shake during printing) ensures stable printing and long time working. 8. We provide automatic feed in and take up system for PVC Printers, especially adopt all-aluminum dual power take up system to carry and collect the whole weight of media more stably and easily. Professional soft film collecting and feeding system is optional too. 9. Tarpaulin Printers equipped with intelligent media sensor that always tests media before media is going to running out. 10. Anti-collision system was also equipped on PVC Printers. When the sensor installed on the both sides of the carriage, which automatic detect any force on the carriage way going, the carriage will initiate an immediate stop to protect the printheads from unexpected damage. 11. Automatic capping system is easy operation and maintenance for Tarpaulin Printers. 12. Bulk ink supply system is standard option for this PVC Printers, which is setting on the top of printer, easy to monitor ink level and easy ink refill. 13. Tarpaulin Printers adopt USB 2.0 interface control system that get better large data transfer and anti-signal interference. Otherwise, it is also supporting windows7/64bit system. 14. 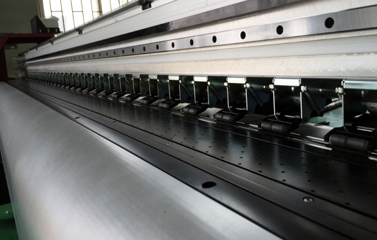 PVC Printers adopt metal optical cable, which connects from mainboard to carriage board to make sure fast and stable data transit. 15. Tarpaulin Printers equipped with two original Leadshine Motor Control, which provide more stable quality and better efficiency during printing. 16. PVC Printers adopt new variable size droplet technology, six or more variable droplet printing size provide the highest printing resolution up to 2880dpi. 17. Tarpaulin Printers benefit from VSDT technology, the smallest droplet can reach to 1.5pl and the maximum can reach to 27pl, which presenting perfect printing quality. 18. As the top quality PVC Printers in China also adopt widened 65mm Multi-touch pinch roller system instead of 40mm pinch roller, which is 25mm wider than normal pinch roller. This 65mm pinch roller system can provides excellent control of media feeding; ensure high precision of large format eco solvent printing. 19. 3.2m Tarpaulin Printers standard equipped with two types of feed in & take up system for choice. One is heavy-duty feeding & collecting system, used for printing one whole 3.2m roll of material, especially for printing outdoor flex banner with high precision; the other is light-duty feeding & collecting system, which can print two rolls of material at the same time. You can choose one roll of 1.52m and another roll 1.27m or double roll of 1.27m for same time printing. The two systems can be switched through push-pull easily, both with auto deviation-rectifying device, ensuring wide format printing high precision.